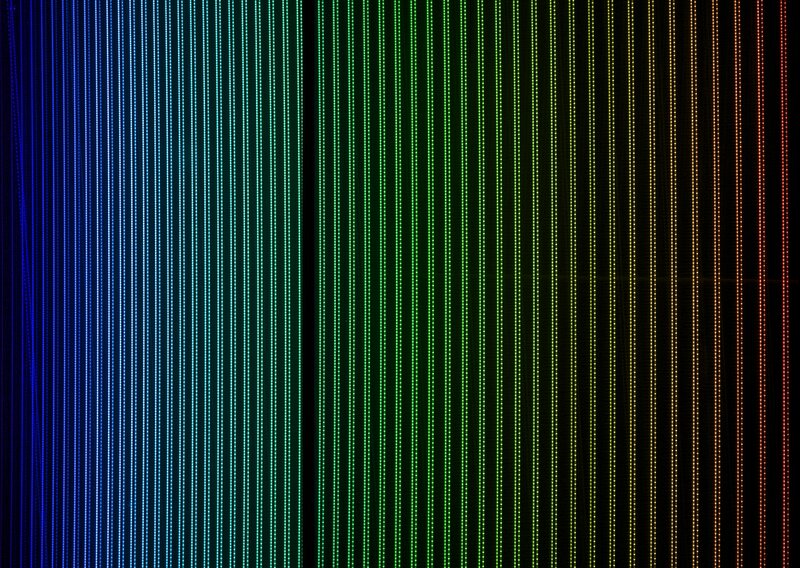 The HARPS laser frequency comb is now installed on the HARPS planet-finding instrument on the ESO 3.6-metre telescope at the La Silla Observatory in Chile and has completed an intense first commissioning phase. The increase in accuracy made possible by this new installation should in future allow HARPS to be able to detect Earth-mass planets in Earth-like orbits around other stars for the first time. A laser frequency comb can be used as a ruler with which spectra from astronomical objects can be measured with unprecedented precision. They will allow the tiny changes in stellar velocity induced by an Earth-like planet as it orbits a star to be detected. The aim is to create such a system for the HARPS planet hunter on the ESO 3.6-metre telescope that is available for nightly observations at the La Silla Observatory. The laser comb system has been completely re-engineered since its experimental run in 2012, and now provides increased reliability, broader wavelength coverage (from 460 to 690 nanometres) and about 15 000 lines per spectrum. The team of Brazilian, Spanish and ESO astronomers travelled together with team members from MenloSystems GmbH and the Max Planck Institute for Quantum Optics to Chile to assemble and test the system continuously for ten days. The test run, completed on 18 April 2015, was an essential step in assessing the precision, reliability and accuracy of the system. An in-depth analysis of the roughly 3000 spectra collected is now underway. Two fully independent laser frequency combs operating simultaneously and with different line spacings were tested, in order to demonstrate the accuracy of the system by using an independent source, and to isolate comb-related systematics. The second comb used during the tests was on loan from the Universitäts-Sternwarte München. A precision in measuring stellar velocities of better than 0.2 kilometres/hour (5 centimetres/second) on a single exposure was obtained. This improved to better than 0.07 kilometres/hour (2 centimetres/second) when subsequent exposures were combined . By comparison, the amplitude of the radial velocity induced in the Sun by the Earth as it orbits is 0.3 kilometres/hour (9 centimetres/second), so the new laser frequency combs in principle enable, for the first time, the detection of Earth-like planets in Earth-like orbits . A second test run will follow to address some as yet unresolved points, and to demonstrate that the laser frequency comb is ready for routine operation by non-specialists. The HARPS laser frequency comb project is a collaboration between the Federal University of Rio Grande do Norte, Brazil, and the Instituto de Astrofísica de Canarias in Spain and ESO. The comb itself is being developed by MenloSystems GmbH in Munich. This is the first instrumental project at ESO conducted in partnership with a Brazilian university. This is equivalent to measuring truly tiny displacements of the spectrum on the detector — 0.85 and 0.34 nanometres respectively — by comparison the separation of the silicon atoms in the crystal lattice of the detector is 0.54 nanometres. This assumes that other sources of noise, such as the presence of star-spots or other stellar activity, are not so great as to swamp the signal from the orbiting planet or that their contribution could be either modeled or averaged out.